DODGE CITY, Kan. (June 15, 2018) – Liberal’s Steven Richardson reeled in his first career feature win atop the 3/8-mile Dodge City Raceway Park clay oval by wiring the field in Friday night’s Second Annual Lubbock Wrecker Service DCRP vs. URSS 305 Sprint Car Nationals 20-lap preliminary feature. It wasn’t without a threat for the point though, as Luke Cranston closed in past the halfway point and was challenging before getting into the turn two wall. Richardson led the rest of the way to best the 36-car field that will vie for a $3,000 winner’s share on Saturday night. While Richardson enjoyed victory lane, Troy Burkhart bagged his second DCRP win of the season by topping the 15-lap IMCA Stock Car main event. 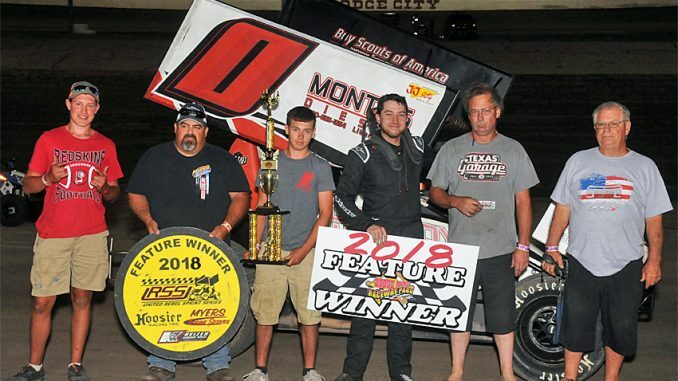 Fairview, Oklahoma’s Jake Martens led the Precise Racing Products DCRP Sprint Cars vs. United Rebel Sprint Series (URSS) feature field to the green flag from the pole position but it was outside starter Richardson gunning into the lead at the outset. Richardson slipped away early on, leaving Martens and Ray Seemann to dice for second until Cranston battled past for second on the seventh round. With Richardson reaching the tail of the field at the midway point, Cranston began to close the gap. By the 12th round, Cranston was pressuring the leader and looked to the outside of turns one and two on the 14th lap only to jump Richardson’s right rear tire and get into the wall. The incident brought Cranston’s night to an early end. When action resumed, Richardson was able to distance himself from the field aboard the Myers-powered Poor Boy Kustomz/Richardson Trucking No. 0 J&J as Martens and Seemann traded sliders for second, ultimately taking the checkered flag comfortably ahead of the pack dicing for position in his wake. Behind him, Seeman finally prevailed with the runner-up position while Colorado’s Jake Bubak rallied from the 12th starting position to crack the podium on the final lap. Liberal native turned Lincoln, NE, resident Jason Martin raced from 13th into fourth as Martens fell to fifth on the final round. Liberal’s Koby Walters was sixth with two-time and defending track champion Taylor Velasquez of Turpin, OK, in seventh. Colorado’s Nick Haygood was eighth with Liberal native Tony Bruce, Jr., and Zach Blurton completing the top ten. Seemann, Walters, Todd Plemons, Bruce, Jr., and Richardson topped heat race action with Wichita Falls’ Chad Koch and Blurton winning the “B” Mains. Colorado’s Dave Wechsler went for a wild ride in turn three on the opening circuit of the night’s first heat race. Wechsler escaped injury but was done for the night. In the 15-lap IMCA Stock Car feature, Hays’ Troy Burkhart raced from the ninth starting position to capture his second DCRP score of the year. Burkhart needed just a half dozen laps to take command on the high side after Larry Baird paced the opening handful of rounds. It wasn’t over though, as Will Bauer moved in to the pressure for the lead. And, after sitting 11th following a second lap caution, Angel Munoz worked his way up to third by the 12th circuit and found new life when a caution flew with just two laps remaining. Munoz quickly disposed of Bauer for second on the restart and pressured Burkhart but to no avail. Munoz settled for runner-up honors with Michael Pepper, Chris Oliver and Shannon Maughlin rounding out the top five. The Second Annual Lubbock Wrecker Service DCRP 305 Sprint Car Nationals concludes with Saturday night’s $3,000-to-win championship finale. IMCA Sport Modifieds and IMCA Stock Cars will be in action as well with the green flag flying at 7:30 p.m.
Heat One (8 Laps): 1. 72-Ray Seemann, 2. 49x-Luke Cranston, 3. 35k-Chad Koch, 4. 11x-Jason Martin, 5. 97-Brian Herbert, 6. 2b-Brett Becker, 7. 18-Brandon Sprott, 8. 45x-Dave Wechsler. Heat Two (8 Laps): 1. 33-Koby Walters, 2. 21x-Taylor Velasquez, 3. 2J-Zach Blurton, 4. 50-Jed Werner, 5. 49-Kris Moore, 6. 7-Shane Sundquist, 7. 17x-Kade Hagans. Heat Three (8 Laps): 1. 4-Todd Plemons, 2. 95-Buddy Tubbs, 3. 48-Jake Martens, 4. 911-Ty Williams, 5. 31m-Eric Mathews, 6. 17s-Chad Salem, 7. 45k-Kolt Washburn. Heat Four (8 Laps): 1. 224-Tony Bruce, Jr., 2. 98-J.D. Johnson, 3. 8J-Brandy Jones, 4. 74b-Jake Bubak, 5. 10-Jordan Knight, 6. 45-Lonnie Cox, 7. 9d-Lance Davis. Heat Five (8 Laps): 1. 0-Steven Richardson, 2. 83-Austin McLean, 3. 1-Nick Haygood, 4. 11k-Tyler Knight, 5. 33k-Aaron Ploussard, 6. 42-Chris Crowder, 7. 51r-Ross Essenburg. First “B” Main (10 Laps – 3 Transfer): 1. 35k-Chad Koch, 2. 8J-Brandy Jones, 3. 49-Kris Moore, 4. 45-Lonnie Cox, 5. 31m-Eric Mathews, 6. 9d-Lance Davis. 51r-Ross Essenburg (DNS). Second “B” Main (10 Laps – 3 Transfer): 1. 2J-Zach Blurton, 2. 10-Jordan Knight, 3. 2b-Brett Becker, 4. 33k-Aaron Ploussard, 5. 7-Shane Sundquist, 6. 42-Chris Crowder, 7. 17x-Kade Hagans (DNS), 8. 45k-Kolt Washburn (DNS), 9. 45x-Dave Wechsler (DNS). “A” Main (20 Laps): 1. 0-Steven Richardson (2), 2. 72-Ray Seemann (4), 3. 74b-Jake Bubak (12), 4. 11x-Jason Martin (17), 5. 48-Jake Martens (1), 6. 33-Koby Walters (6), 7. 21x-Taylor Velasquez (14), 8. 1-Nick Haygood (8), 9. 224-Tony Bruce, Jr. (7), 10. 2J-Zach Blurton (20), 11. 98-J.D. Johnson (16), 12. 83-Austin McLean (9), 13. 35k-Chad Koch (19), 14. 4-Todd Plemons (3), 15. 11k-Tyler Knight (17), 16. 97-Brian Herbert (18), 17. 2b-Brett Becker (19), 18. 95-Buddy Tubbs (15), 19. 49-Kris Moore (23), 20. 50-Jed Werner (10), 21. 911-Ty Williams (11), 22. 49x-Luke Cranston (5), 23. 10-Jordan Knight (22), 24. 8J-Brandy Jones (22-DNS). Heat One (8 Laps): 1. 20-Tyler Walker, 2. 52-Larry Baird, 3. 17m-Shannon Maughlin, 4. 57-Will Bauer, 5. 25x-Troy Burkhart, 6. 17-Ryan Keller, 7. 52T-Travis Baird. Heat Two (8 Laps): 1. 2m-Angel Munoz, 2. 33-Marlin Hogie, 3. 10-Dusty Withuhn, 4. 3-Chris Oliver, 5. 2z-Cody Zimmerman, 6. 22p-Michael Pepper, 7. 97x-Ondre Rexford, 8. 771-Steve Blunk. “A” Main (15 Laps): 1. 25x-Troy Burkhart, 2. 2m-Angel Munoz, 3. 22p-Michael Pepper, 4. 3-Chris Oliver, 5. 17m-Shannon Maughlin, 6. 52-Larry Baird, 7. 52T-Travis Baird, 8. 33-Marlin Hogie, 9. 10-Dusty Witthuhn, 10. 771-Steve Blunk, 11. 17-Ryan Keller, 12. 97x-Ondre Rexford, 13. 57-Will Bauer. DNS: 20-Tyler Walker, 2z-Cody Zimmerman.